Woodstock Union High School Innovation, Design, Engineering and Action (IDEA) students have learned to be empathetic by designing for it. 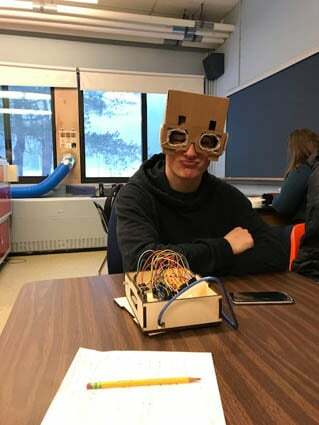 Creating devices that simulate the challenges that arise from concussions, obsessive compulsive disorder (OCD), ALS, and dyslexia, students hope that experiencing the frustration that comes with these disabilities will bring about understanding, and maybe some coping tools. Owen Tarleton models one of the prototypes for a helmet to simulate concussions. The four teams of students will present their design process, prototypes, and final products from 8-9:15 a.m. on Thursday, Jan. 18 in the Rhoda Teagle Library at the school and the public is invited to attend. “The focus is on the design process, to design a physical product that allows people to experience some form of disability,” IDEA teacher Andy Smith said about the project for the semester. They began by researching various disabilities and their challenges and then each team of two-three students, chose a disability to focus on, going through several prototypes to come up with a device that simulated the symptoms or challenges associated with that disability. Students used the school’s new NuVu Innovation Lab. The current lab is a temporary one as the new 2000-foot lab should be completed later this winter. Some students found inspiration for these empathy projects from their own challenges. “We’re trying to simulate a concussion. All three of us have had concussions,” student Owen Tarleton said of the concussion helmet he designed along with Kyle Weirether and Ethan Earle. It took three prototypes before the team came up with their final design. They went from a cardboard box model with glasses to a helmet with adjustable straps and glasses. The final model is the most precise. “We 3-D printed all the parts…it tightens a lot better,” Weirether said, noting the first model only fit their heads and they knew it had to be flexible so anyone could try it. “It gives you all of the symptoms of a concussion at once,” Tarleton says about the dizziness, nausea, and sound delay that is simulated. “It’s about helping other people learn and making it easy to self-diagnose for the future,” Earle said of their product. Justin Kopf and Andy Seiple created an OCD Box for their project. Their final product is a wooden box with shapes that have to be lined up with images on the box within 15 seconds. “We want to simulate the stress and anxiety in the brain,” Kopf said about the challenge to do this task when the box is designed, with a motor, pegs, and friction, to fight against the operator trying to make it perfect. Will Crompton and Angus Farrand created a Dyslexic Keyboard. “You plug it into your computer and it will randomly put in a letter or number while you are typing. It makes you feel the frustration of dyslexia,” Farrand says. This winter, the students will get to dive even deeper when they partner with Vermont Adaptive Ski and Sport to create products to help people with disabilities. “They will work with a potential client,” Brugmann said. They may create a new product or fine-tune one of the devices used to allow people with various disabilities to ski or participate in other sports.